Released with a inner sleeve with lyrics and credits in one side and photos in the other side. Original ℗ 1990. Remastered ℗ 2015. The copyright in this sound recording is owned by: Iron Maiden LLP under exclusive license to Parlophone Records Limited., A Warner Music Group Company. This label copy information is the subject of copyright protection. All rights reserved. © 2017 Iron Maiden LLP. Administered by Imagem London Limited. Made in the EU. 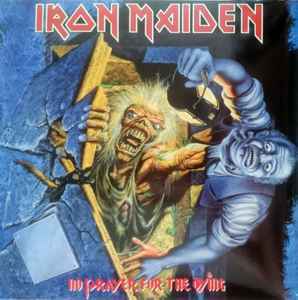 Recorded at Steve Harris' Barn, somewhere in England on the Rolling Stone mobile. I have this exact one and the front cover is quite alright, no misprint at all. The cover artwork is not misprinted, this is the original artwork from 1990 some elements were added and removed for the 1998 remastered version on CD such as the writing on the plaque and the gravedigger. I think the decision to go back to the original was made for authenticity reasons as they stated they would be exact replicas of the original covers. This album marked a return to shorter songs and a rawer less polished sound with no epics sadly the songs simply were not good enough as a whole. The promise of Tailgunner is wasted by a chorus lacking inspiration, the best thing on here is the cool refrain of the title Track which follows the blueprint of Remember Tomorrow sadly the song is ruined by a chaotic change of pace which lacks the usual maiden discipline and melody - the album doesn't recover after this - the only highlights are some of Dave Murrays brilliant melodic solos and couple of rasping Janick Gers solos on Bring Your Daughter and The Assassin which highlight his full on aggressive and some what unorthodox playing style. The quality of this album can usually be reflected in the fact that most of the songs have not been played since the album tour - the only song that has had a recent outing was Bring Your Daughter during maidens in between album tours. Most people will remember Bring Your Daughter going to number one in January 1991 as a result of a clever trick to release some 7 formats of the single. Sounds ok, but JESUS that front cover...what a sh*t show!, there is a section where the metal plate joins onto Eddie's grave and it has been very badly photoshopped/clone stamped to fit the cover. Awful.